A ‘loss’ in its Kickoff Classic has sent IMG Academy (Bradenton, FL) from No. 6 to No. 11 in the first update of the Media Compilation Top 25 rankings. The Ascenders fell in its four-quarter battle with American Heritage (Plantation, FL), 19-7. The team had two touchdowns called back on holding penalties — including one on the second to last play of the game, which would have tied the contest at 13 with the extra point pending. The following, final play, was an interceptions that was returned for a touchdown to set the final margin. Its setback is not reflected in the overall record of the team because in-state kickoff classics are counted as exhibition games in Florida but the perception had shifted in three of the six polls — with the HSFB100, USAToday 25, and MaxPreps 25 dropping IMG into the 20s. PrepNation as well as the Jeff Fisher algorithm did not update their polls this week and the CalPreps Computer did not take into account the IMG result and the team remained in its preseason placement on those three services for another week. The Media Compilation takes into account the four most respected human polls, the top computer model, and an emerging hybrid human-algorithm to make for the best rankings in the country. Those under consideration are the NationalHSFootball.com HSFB100; USAToday Super 25; MaxPreps Xcellent25; PrepNation Top 25; Jeff Fisher’s Top 25 and the Freeman Computer Top 25. For a mathematically sound compilation each team is given points from 40 to 16 for being inside the Top 25 of each of those six polls with no points awarded for any additional rankings due to the differing size of each poll. Points are assigned in decreasing value starting with 40 being awarded for No. 1 and on down to 16 for No. 25 which will result in a more accurate representation of the polls. Assigning points starting at 1 point would skew the tally in the instance that a team received a single, high placement versus a team with lower placements in multiple polls, raising the baseline eliminates the outlier impact in the compilation. The poll will be updated and released each Tuesday of the football season. The Spartans lost a spot in the CalPreps poll this week and saw its lead at the top shrink from 4 points to one. De La Salle will take on Euless Trinity in Texas this week and that result will impact its placement immediately. Bishop Gorman added two points despite not starting it season by sliding up one spot within the HSFB100 and USAT polls to backfill the spot lost by IMG. The Gaels will take on No. 14 Chandler at home this weekend and could jump to No. 1 with a convincing win or have its title hopes dashed with a loss. Aquinas was not punished for its lackluster performance against Dillard in its Kickoff Classic like IMG was for its loss. The Raiders offense was flat and struggled for most of the game against the local program before pulling away in the fourth quarter. The Raiders gained an eight-spot improvement at MaxPreps while remaining unchanged in the other five polls. Could this be the season that DeSoto breaks through with a state title? If the Eagles can run the table it would have wins over No. 5 Allen, No. 11 IMG and No. 13 Cedar Hill. With that resume it could push to the top spot although it was jumped by three teams in the CalPreps rankings this week. Allen will have a stronger defense from last year with most every starter returning and the bend-don’t-break could turn into a force. The offense has a lot of turnover but a strong OL could ease in the season. The schedule works in its favor — until the playoffs, then look out. It fell a few spots in three of the four active polls this week despite being idle. Miami Central went from No. 18 to outside of the Top 25 in the computer rankings despite being idle this week. It travels to No. 8 DeMatha this weekend and with a win will certainly move back into the Top 5. There may be no more explosive offenses in the entire country. Centennial returns an impressive lot of talent on the scoring side of the program and this is a definitive offense-first program. The goal to outscore opponents has largely worked as the Huskies have been one of the most successful teams in California — and the country — the last 15-plus years. It gained one spot in the HSFB100 and USAT but slipped four in the CalPreps computer. There is no question that the Stags bring back a ton of talent. The issue is that it lost some games that many think it shouldn’t have last year. There is also the perception that still lingers from the last time DeMatha was ranked this high and it was blown up on television by St. Joseph Regional (Montvale, NJ). An opener with No. 6 Miami Central will tell the tale if this team is a National Title threat or not. One of the most curious splits in the Top 10 has St. John Bosco with two No. 1 placements from human pollsters but the CalPreps model — which has named a California team its national champion the last four years — doesn’t have the Braves in the Top 25. The schedule will sort this out as trip to Oregon, New Jersey, and potential showdowns with No. 1 De La Salle and No. 7 Corona Centennial loom. Archer put a running clock on North Paulding to open the season and saw movement in opposite directions as a result. The HSFB100 moved the team to No. 2 in the state of Georgia and dropped it five spots in the poll, while CalPreps moved it into the Top 25 from the outside to No. 23. It was a net gain in total points and pushed it to the Top 10. The Kickoff Classic results was held against the Ascenders in three polls as the HSFB100 dropped the team 16 spots, MaxPreps moved it down 18, and USAToday moved it 20 from No. 2 to No. 22. It has Miramar (FL) this week and then No. 4 DeSoto (TX) to follow. The exclusion of Katy in the USAToday rankings stand out like a sore thumb — especially as the paper is ranking teams like Webb City (MO). The Tigers have the most talent the program has had in some time and many are expecting big things. This team should be a unanimously ranked group in no time. It also fell five spots in the CalPreps model this week, behind a Clinton (MS) team that lost its opener by 10 points. It is going to be hard for head coach Joey McGuire to play the ‘no respect’ card with his kids as the Longhorns come in at No. 13 nationally. There was tremendous turnover in the offseason but most just expect this next group to be as successful as the last. The Longhorns made a move this week despite not playing as the CalPreps Computer jumped it from outside the Top 25 to No. 20. The concern about breaking in a new quarterback were immediately eliminated at Mason Moran had a great opening game as Chandler won in a rout. It was a good tune-up for a showdown with No. 2 Bishop Gorman this week. The team gained six cumulative points but did not change its overall placement. Mallard Creek put one of the worst losses on Charlotte Independence in its opening week victory. Not being ranked in the USAToday and CalPreps model is just stunning with Webb City (MO) being ranked at the newspaper and a Clinton (MS) team that lost its opener by double digits making a jump in the algorithm. Mallard Creek would beat both, handily. Colquitt moved up to the No. 1 spot in Georgia and the Top 10 in the HSFB100 with its dismantling of North Gwinnett to open the season. The result cause the Packers to fall out of the CalPreps Computer ranking. The offense brings back its QB, top two WRs, and a RB that was forced into action last year. The Cougars were able to roll over Blackman (TN) in its opener and get the back-ups in before the end of the third quarter. That may become a common storyline this year. Neither computer-based model likes the Dolphins entering the season. The team brings back too much talent to ignore. The state of Virginia figures to be tough at the top and this program could ride that tide to a Top 10 finish as perception starts to shift about programs in this state. Manvel comes in at No. 5 in Texas, which is still good for No. 19 in the country. If that isn’t respect for the brand of football being played in Texas there is nothing else the media can do. The offense will score on most anyone, the defense has improved. The question will still come down to a showdown with Katy. Can the Mavericks get passed the mental hurdle of downing the Tigers? 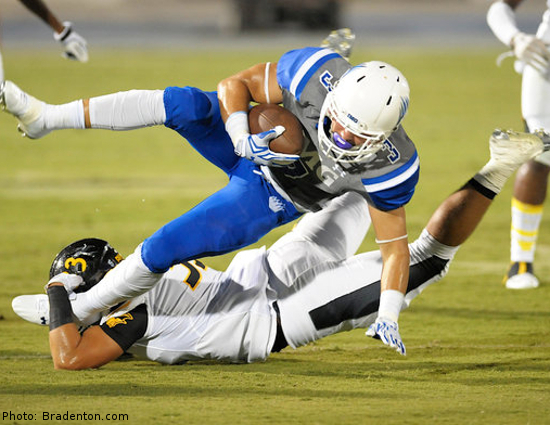 Amat burst onto the scene last year by crushing Texas 5A champions Aledo and then had a solid season in California, finishing in the Top 50 of the HSFB100. This year the expectations are higher for the Lancers as the No. 4 team from the state. It will open with Mater Dei this week and should be tested by the Monarchs defense. The out-of-state record for the top teams in Jersey is impossible to ignore and as such the benefit of the doubt has started going to the top teams in the state. Paramus Catholic will have a very strong defense this year and its offense has the talent to develop into a legit operation. The schedule is no joke and results will dictate how high the Paladins go — or if a different teams from the Garden State takes this mantle. The Chargers jumped on Southaven in a big way with quarterback Jack Abraham opening his senior year by finding standout receiver DK Metcalf for over 100 yards and a score. Those two will put up that effort most every week. In a curious flip in perception the sites that were last on the Mainland train last year are higher on the Bucs than the HSFB100 and USAToday, which were first and second on board last year. The defense is still there but the offense is worrisome. The schedule will answer some questions. South Panola went to the Wildcat to solve its quarterback situation. The 35-25 win was not impressive over Clinton but it did get the job done. The USAT dropped the Tigers out of its Top 25 while the CalPreps Computer moved it to the Top 10 and added the Clinton team it defeated to the Top 25. The state of Ohio is going to sort itself out this year but in the early going a few sites have tabbed Colerain for the top spot. The team has a solid offense — with an explosive quarterback — and its young defense that opened last year should be tested and better this year. Those are two big assumptions that will get tested before September is over. Previous No. 25 Bingham (South Jordan, UT). Bingham (67); Cincinnati La Salle (60); Flanagan (48); American Heritage (43); Spartanburg (41); Rummel (36); Mililani (33); Cocoa (28); Christian Brothers (27); Saguaro (26); Good Counsel (25); Bergen Catholic (24); Mater Dei (23); St. Edward (22); Webb City (20); Clinton (19); Pittsburgh Central Catholic (19); Euless Trinity (18); Steele (17), and Westfield (16). Carmel (IN) and Gilman (Baltimore, MD).